I’ve also pulled some of the information about each book from Goodreads. I know I’m looking forward to Spinning Silver (also from Del Rey) because I enjoyed her latest book, Uprooted, so much. It looks like it’s going to be a great summer for reading. Hey all, Age of War is coming, and as such I have a few giveaways to tell you about. 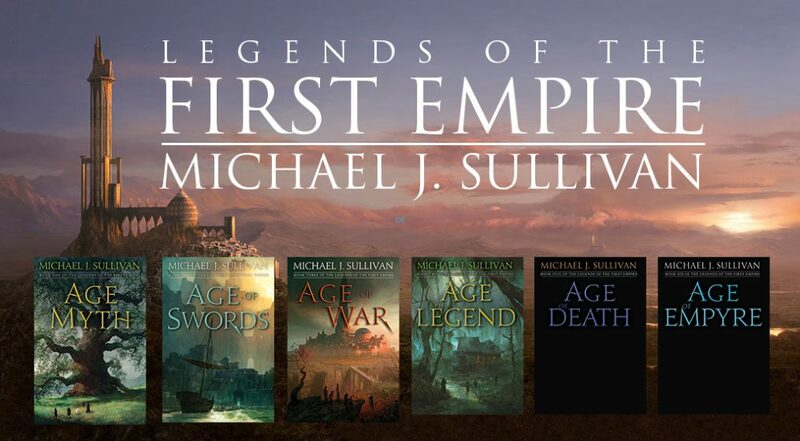 First, there is a drawing for first edition copies of all three Legends of the First Empire books. This is open to people from all countries and we’ll do the drawing at the end of June and ship the books in early July. 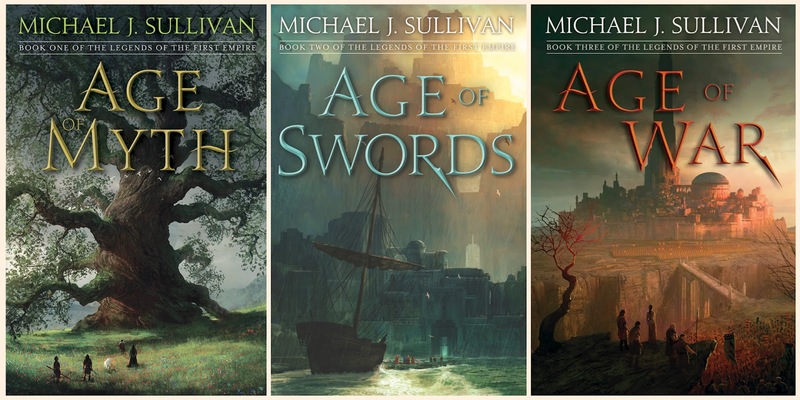 There have been several printings of Age of Myth (and I think Age of Swords has also gone into at least one reprint) so this is an excellent chance to get books that might not be available anywhere else. Second, my publisher is giving away 25 copies of the Age of War Advanced Reading Editions. This drawing ends April 21st and the books will ship shortly after, that means people who win this drawing will be able to read the book several months before the official release date. For people who are pre-ordering the book, I hope to have a pre-order promotion posted soon where you can receive some initial chapters of the new book as well as some bonus material. Stay tuned for that! Hey all, did you know we are just 3 short months away from the release of Age of War? I’m so excited to hear what you all think of the new novel. We are working hard to get information posted to help people “ramp up” quickly so I’ve added the following to this website. The glossary is spoiler-free, so between it and the recap you should be up to speed and not need a re-read of Age of Myth or Age of Swords, but if you do re-read even better! In the next few days I’ll also be posting some sample chapters, and we are going to be putting together some bonus stuff for people who pre-order so keep your eyes open for both of those. Oh, and in case you need a recap for Age of Myth, here is a link for it as well. I just heard from my publisher that Age of War is going to be moved from April 17th, to July 3rd. I’m sorry about this slip, but in the grand scheme of “late releases 75 days isn’t that bad. Why did this happen? Well a few things. When we received the copyedited book, there were a few little things that needed correcting. Nothing major…it’s not like I had to add or remove entire chapters, but there were some things that Robin pointed out and as it was our last chance to make changes we decided that the book would be better if we bite the bullet and addressed them. We received the copyedits on 11/2 and had a deadline of 11/15. And as we did our final review we realized that deadline was going to be missed. I generally don’t have deadlines (because I write entire series before publishing the first book). For the times I am under deadline, I take those dates seriously, and this was the first time I missed a delivery. But I’d rather have the book good than fast, and I think that was the right choice to make. Del Rey received our changes on 1/10, and of course anything “new” that was written has to go back to the copyeditors. They were very understanding and total professionals about this. I love that they are as dedicated as we are to providing a great product. We’re getting printer’s proofs on 2/13 and we’ll need to have everything back to them on 2/27. Ironically we leave for vacation a few days before that! But no worries, we’ll make it a “working vacation” and we WILL hit that deadline so there is no further delay. So, that’s where we stand. Sorry about the delay. But all in all I’m pretty happy the speed of our releases as a whole. This will mark the 5th book released in 2 1/2 years…and that’s not so bad. In other news, I’m working on the edits to Age of Legend (Legends of the First Empire #4) and the book is coming out really well. We don’t have a release date yet, but we hope to soon. A lot of people have asked me the following question in one way or another. Since you wrote the whole series before the first book was published, and Age of Myth is now out. What are you doing now? It’s a reasonable question. The answer is I’m working on edits to the last book. But I thought you wrote the whole series already? What gives? Well, there is a huge difference between written and finished. So let me explain the process and where I am. So, here’s the steps I go through to get a book from my head to the shelves. Initial writing…and during this stage no one sees the book during the first draft. I may vaguely talk about some points with Robin during the writing stage, but not even she gets to see the book until I’m done. After writing the book it goes through a second pass edit. Usually there are notes I made while writing that I have to incorporate to accommodate changes I made from my outline during the writing process. I read over the book one last time (and make some really minor changes) before any eyes can see the book. Robin (my wife) reads the book and usually has a lot of input for changes…most of which I agree with and incorporate. Robin holds a beta read to get feedback from other people. The book goes to my editor at Del Rey (this may happen at the same time as #7 or after #11 below). Feedback from he beta is organized by Robin and I incorporate the changes. Robin does another copy and line edit after the beta feedback is incorporated. Feedback from #8 is incorporated in the book. Robin does another copy and line edit after the publisher’s feedback is incorporated. Now the book is ready for professional copy editing, and it goes to the editors the publisher employs. Copy edited comments come back and Robin works through the main meat of them and highlights things she feels I’ll have to address – and I do. I read over the whole manuscript from front to back and during this read any minor changes that were done by the copyediting process that I feel need to be tweaked are. The book goes to layout and at this point all changes are frozen. The book is printed and eventually released. Wow, that’s a long list. Now where are we with all the books in the series? Book #6 is at step #5 – 22 chapters are finished and I’m working on the last six. Now, for some that last line mentioning book #6 may be a surprise (although I’ve talked about it elsewhere). Yes, the series that started out as a trilogy has expanded once again and will end up at six books. That little detail probably deserves a whole post of it’s own, and I’ll do that soon. But here’s the short answer. Robin’s alpha feedback showed that books 1 – 3 were in really clean shape, and didn’t require much in the way of changes. Book 4 – 5 was a another story, and as I fixed the myriad of problems much of book #4 moved to book #5 and the “natural” stop for book #5 turned out to be in the middle of a 230,000 word book so it made sense to split it. I should note that once a book gets to step #6 it’s in pretty good shape and while there are minor tweaks, I’ve yet to have any serious re-writing to a book once it reaches that stage. And most of the heavy lifting is done by people other than me (mainly Robin, the beta readers, and my publisher). So, while I’ve not been free to work on anything else yet, I will be soon. So what WILL I be working on once the last six chapters of book 6 are done? Well, I don’t know yet. What I plan on doing is using the rest of the summer to go through the plots for the 12 – 15 books that are vying for my attention. I hope to have that sorted out by September 1, at which time I’ll start a new project. I like starting books in the fall, it reminds me of returning to school, and is usually my most productive writing times. More on this once I know more.